John Jaszczak has had an interest in collecting minerals since approximately age 4, but became a serious mineral collector at age 13. He earned a B.S. in Physics from Case Western Reserve University in Cleveland, Ohio and subsequently earned M.S. and Ph.D. degrees in Physics from The Ohio State University where he studied surface roughening in crystals and quasicrystals. After conducting computational research in materials physics for two years at Argonne National Laboratory, he joined the physics department at Michigan Technological University where he now serves as Professor of Physics and Associate Dean for Undergraduate Education in the College of Sciences and Arts. He also is adjunct professor in the departments of Cognitive and Learning Sciences, and Materials Science and Engineering. He currently serves as associate director for education and outreach in the university's Multiscale Technologies Institute. He became Adjunct Curator at the university's A. E. Seaman Mineral Museum in 1992, and has served as board chair of the Seaman Mineral Museum Society. Upon the retirement of George Robinson in June 2013, John served as Interim Curator of the A. E. Seaman Mineral Museum, until October 2013 when a new associate curator was hired. This page lists John A. 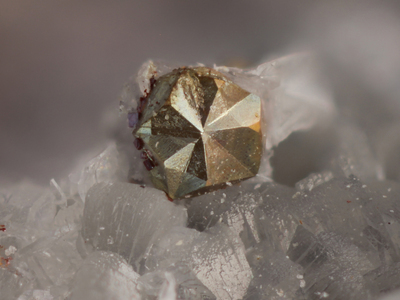 's favourite minerals, localities and photos. All lists in alphabetical order. A pair of twinned Calcite crystals from Smith Quarry, Black Rock, Lawrence Co., Arkansas. 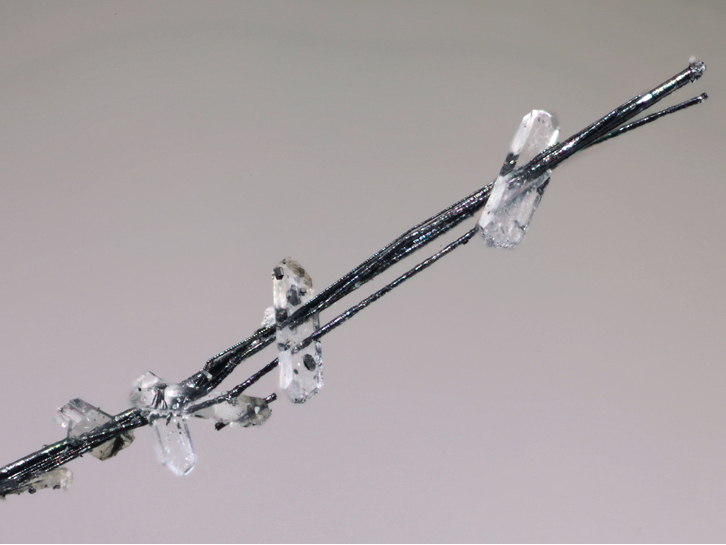 The crystals also show faint phantoms, and the large crystal has a movable gas bubble in a small fluid-filled channel on the back side of the crystal. 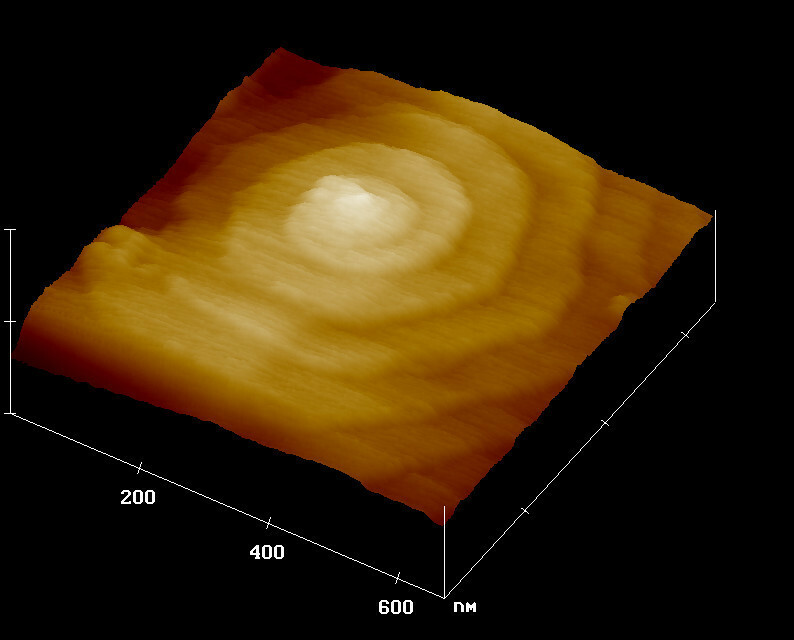 Atomic Force Microscopy, AFM, image (height data) of a growth spiral on the (001) face of a graphite crystal from the Namib Mine, Wlotzkas Baken, Erongo Region, Namibia. Individual steps are 6.7 Å high. Modified from Rakovan, J., and Jaszczak, J. 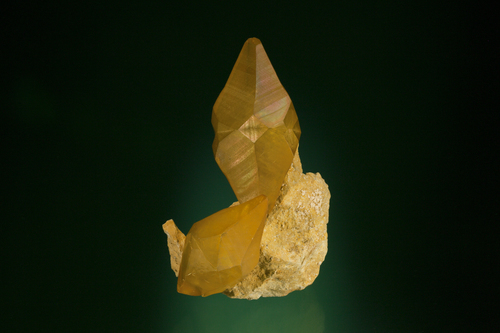 (2002) American Mineralogist, 87, 17–24. 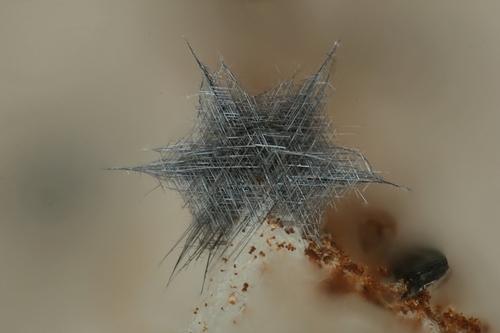 Cylindrical whisker (0.73 mm long) of merelaniite associated prehnite (not shown also include graphite, calcite, and chabazite). For more information see also the open access article in the journal Minerals 6, 115 (2016). http://www.mdpi.com/2075-163X/6/4/115/ (DOI:10.3390/min6040115 ). 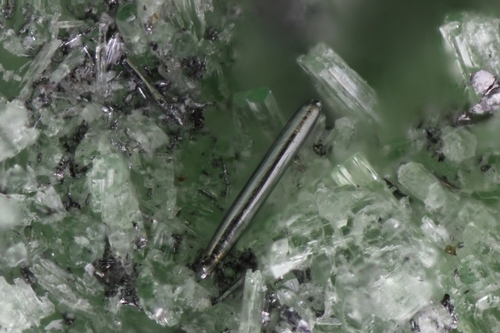 The associated chatoyant, prismatic green crystals have recently been shown to be dravite (Jaszczak, Angi-O’Brien & Rakovan, Rocks & Minerals, in press 2017). 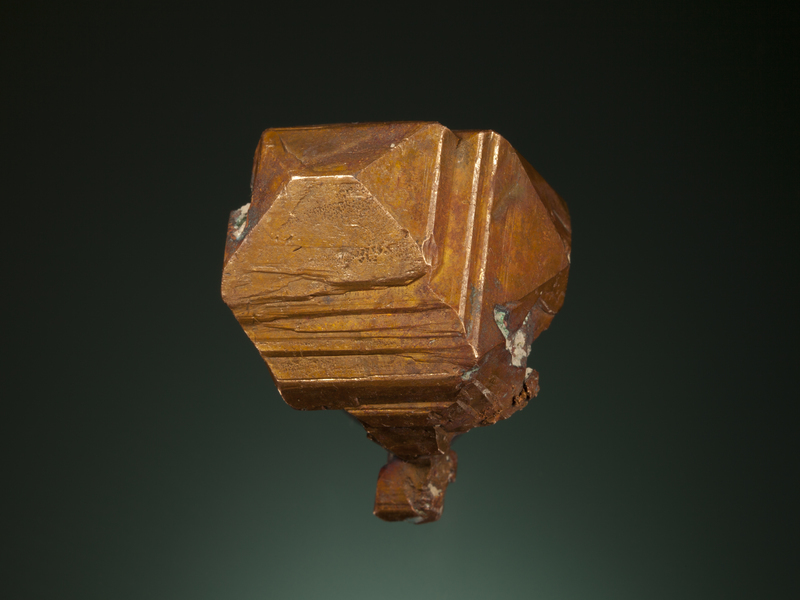 Superb tetrahexahedrdal copper crystal (nearly a floater). Private collection. 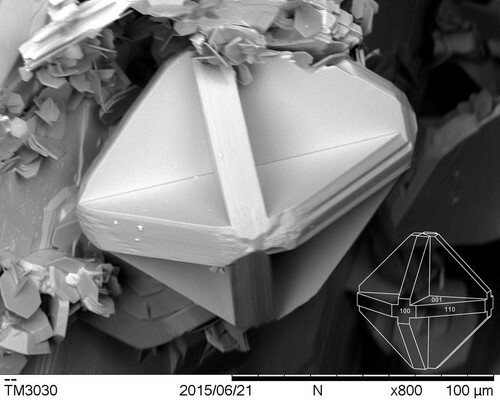 3-mm octahedral diamond crystal partly exposed from host eclogite nodule. 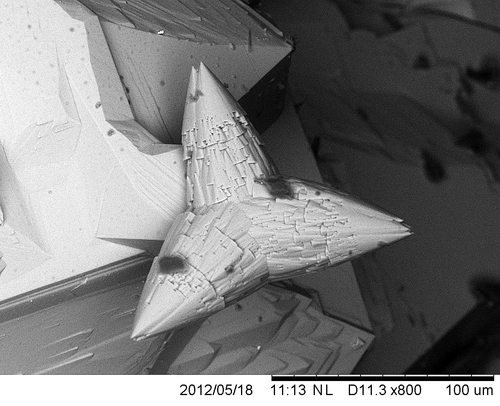 The crystal has some nicely formed trigons on the surface. 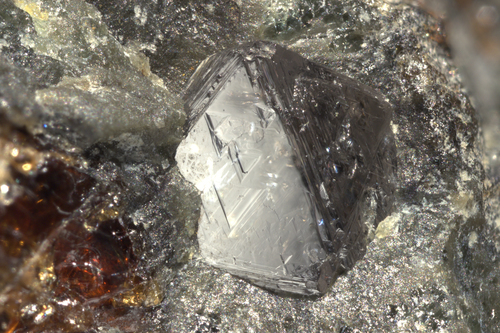 The eclogite also hosts several smaller partial diamonds visible on the surface. 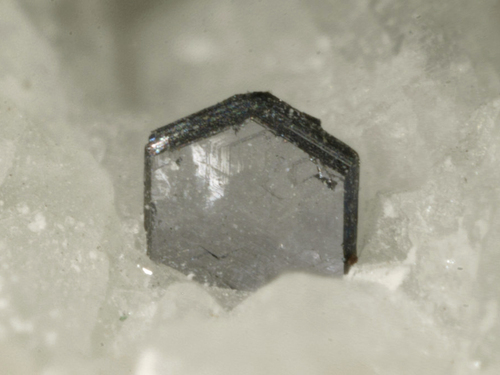 Wurtzite twin grown epitactically on tennantite (see second image). XRD analysis by Prof. F. Nestola (Padova). Collection and photo Philippe Roth, courtesy of PIAG.